Arshatheertham means the holy water from the hands of Rishis. 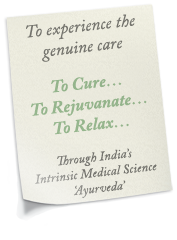 Arshatheertham Ayurveda Hospital is situated on the riverside in an ecofriendly atmosphere. It is located in a village named Keezhattingal. Before treatment, the body is cleansed and detoxified using massage oils, saunas, enemas or laxatives. Ayurveda the knowledge about caring the life is derived and developed through the incessant transcendental power of “Rishis” who lived 5000 years ago. Caring the life is through combining medicines, various treatment programmes, balanced diet, Yoga and meditation. This combination is according to the constitution based on Tridosha Principle. Arshatheertham Ayurveda Hospital is situated on the riverside in an ecofriendly atmosphere. It is located in a village named Keezhattingal which is 15 kms away from Varkala and 35 kms from Trivandrum. The nearest bus station is Attingal and railway stations are Kadakkavoor and Chirayinkeezhu. kitchen remodel cost Houston tx . Watch movies online in 123movies new 2019 site.